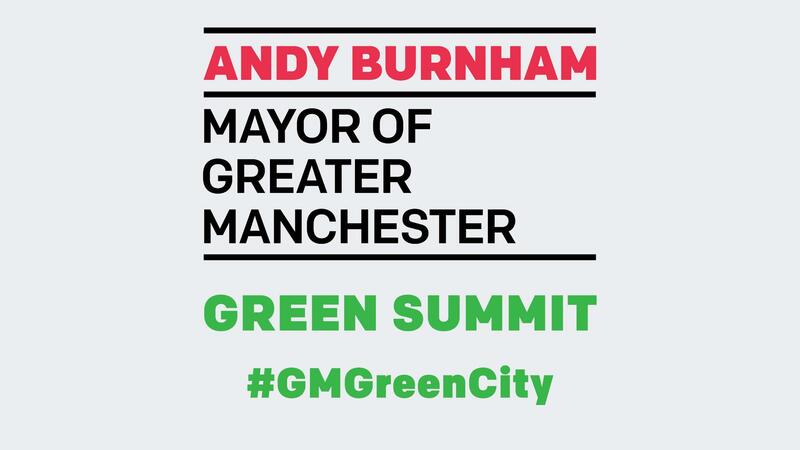 Home » Posts Tagged "Energy Efficiency"
Andy Burnham, the Mayor of Greater Manchester, started proceeding by setting out an aspiration for Manchester to become a zero-carbon city – although he did not pledge a specific date to achieve this, he did suggest that we should be bold and commit to achieving this at least a decade earlier than the current 2050 target date. The reason we need this level of urgency was starkly presented by Kevin Anderson from the Tyndal Centre. His brilliant talk cut through all the complexities surrounding emissions goals and reminded us that there is only one thing that matters – the absolute CO2 emissions that we put into the atmosphere. 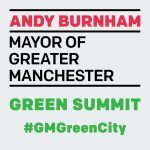 According to research by him and his colleagues we (Greater Manchester) have a budget of just 71 million tonnes of CO2 in order to meet the 2 ºC target we signed up to in the Paris Agreement. At current rates of emissions we will spend this in just 5-6 years. The notion of energy efficiency as an energy resource is now widely accepted. Indeed, since the widespread Demand Side Management programs of the 1970’s, these “Negawatts” (a term coined by Amory Lovins) have been quantified in financial terms and compared with supply-side infrastructure investments and shown in most cases to deliver the lowest cost per unit of energy (LCOE), as well a significant environmental benefits such as lower carbon emissions. 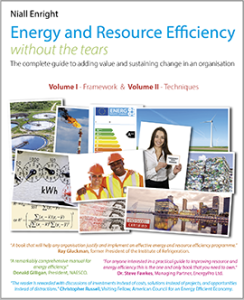 I am absolutely delighted to announce that the two volumes of my book on energy and resource efficiency have now been published as a single book. As part of SustainSuccess’ contribution to sustainability the book, all 840 pages, is being made available FREE, in the Adobe PDF format. 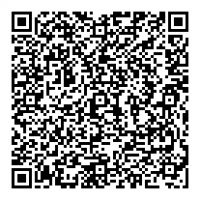 You can get the free PDF easily. Simply go to the store, add the book to your basket and check-out. You will not be charged for the book, and on completing the check-out process, will received a download link to the PDF (17 MB). The combined print version retails for £59.99 in paperback and £79.99 in hardback – including free postage options to most markets. The print versions also include free access to the companion files, for which there is a very modest charge for PDF version readers. Please don’t hesitate to give me feedback on the book. 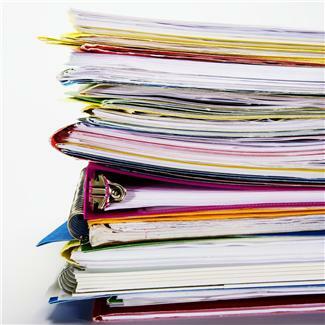 The beauty of print on demand (and PDF) is not only that this is a resource-efficient method of publication but also that the content can easily be updated regularly. You can also award the book between 1 star and 5 stars in the store, so please do come back and give it a rating! The energy management system of Peel Land and Property has recently completed certification to the prestigious ISO 50001 standard. As far as we are aware, it is the first major UK property and development organisation to achieve this accolade. 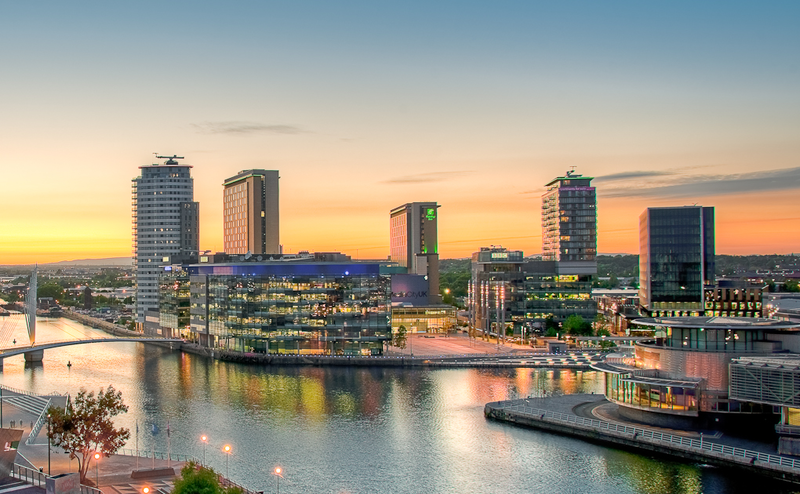 Just to give some scale to the scope, the portfolio of assets certified include 1.2m m2 of property, including prestige offices in Liverpool, Manchester and elsewhere in the UK; the MediaCityUK development in Salford, home to the BBC, ITV and dock10 studios; The Lowry and Gloucester Quays Retail Outlets; EventCity, the second largest exhibition space outside of London; Robin Hood Airport Doncaster Sheffield and Durham Tees Valley Airport as well as extensive residential, industrial warehousing and retail park space. 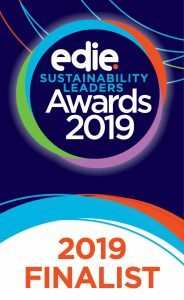 SustainSuccess have been involved throughout in a consulting and mentoring role, writing the system specifications, supporting the implementation of the requirements, undertaking Energy Reviews, establishing the internal audit processes and steering the independent certification by Lucideon to a successful conclusion. The key to success was that the Peel Group already had a very effective energy management process in place, with committed Board level support, dedicated and professional Energy Champions for each business and Verco’s Carbon Desktop as the tool to capture energy data and improvement opportunities. Over the past four years this energy management programme has delivered over £1m of savings per year (against a bill of around £3.5m). This is not Peel’s first accolade. Peel Group had previously been certified twice to the Carbon Trust Standard, and was benchmarked top of 29 property managers and developers by the Trust. The MediaCityUK was a pilot for the BREEAM Communities certification and scored more than the other pilot, the London Olympics site. Since then the Lowry has received a Green Apple award for its environmental efforts, MediaCityUK has received the BIFM award for Sustainability and Environmental Impact and two Premises and Facilities Management awards for Expert Services and the Overall award, largely based on the sustainability and energy efficiency activities. 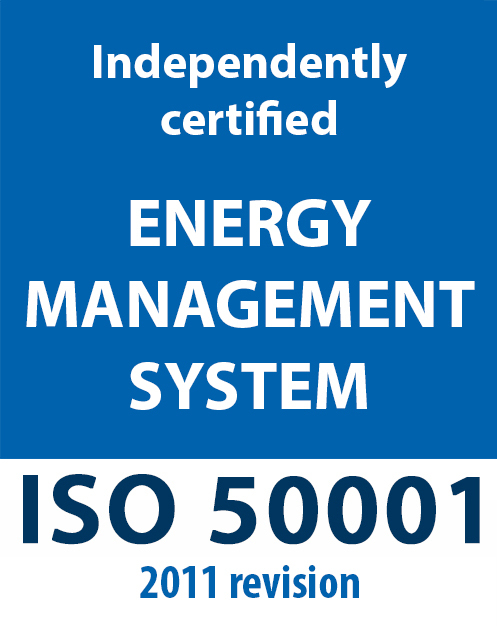 There are a couple key lessons to be drawn from this: we would recommend that organisations put in place a strong energy management process based on continuous improvement, as Peel did, prior to seeking to achieve ISO 50001 as the certification will be much less painful and deliver much greater value. The awards and certification should be seen as the “cherry on the cake” which help raise the programme to a new level. The next key observation is that we should approach the subject of energy efficiency and sustainability as a continuous improvement process. Over the 6 years SustainSuccess has worked with Peel they have never once rested on their laurels and considered the job complete: they have innovated, extended the best practices and constantly set themselves new challenges. This entirely to do with very committed leadership, a culture of improvement and a highly enthusiastic team. Above: the MediaCityUK campus was included in the scope of the ISO 50001 programme. 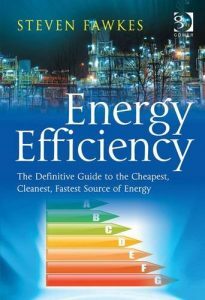 I have been looking forward to reading Steven Fawkes’ “Energy Efficiency – The Definitive Guide to the Cheapest, Cleanest, Fastest Source of Energy“, ever since I heard on his blog that it was about to be published. I have enjoyed reading Steven’s blog for some time now and I regret that I only just missed working with him advising on the new Energy Efficiency Deployment Office here in the UK a couple of years ago – there were three positions and I was fourth on the list! Cest la vie! Certainly I find myself in violent agreement with much of Steven’s observations. For example he starts the chapter on Management Techniques thus: “It is about Management, Not Technology. 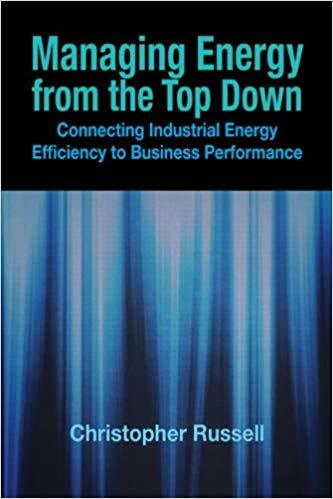 The process of improving energy productivity is not a technical problem. It is a management process“. This is sweet music to my ears. 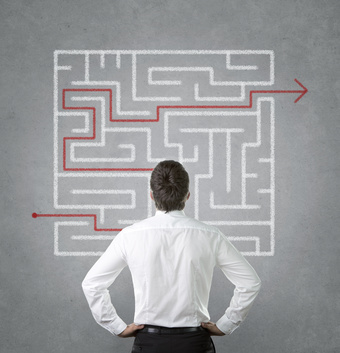 Do we devote enough time on energy audits? 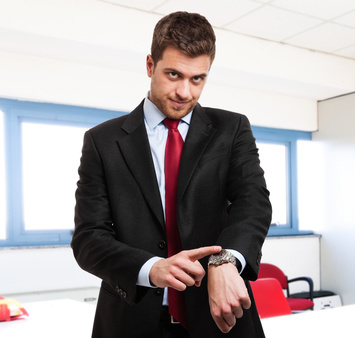 In my experience many energy and resource efficiency audits are rushed. I plead guilty to multiple counts of the the most common cause: designing the budget to meet the client’s expectations rather than the engineering or technical requirements of the job. The question is: Is this approach correct? Many energy and resource efficiency audits fail to properly address opportunity interdependency in their recommendations, which can greatly reduce the credibility and impact of the audit. 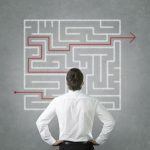 This article aims to shed light on this critical aspect of auditing which is also one of the most creative and enjoyable parts of the process. 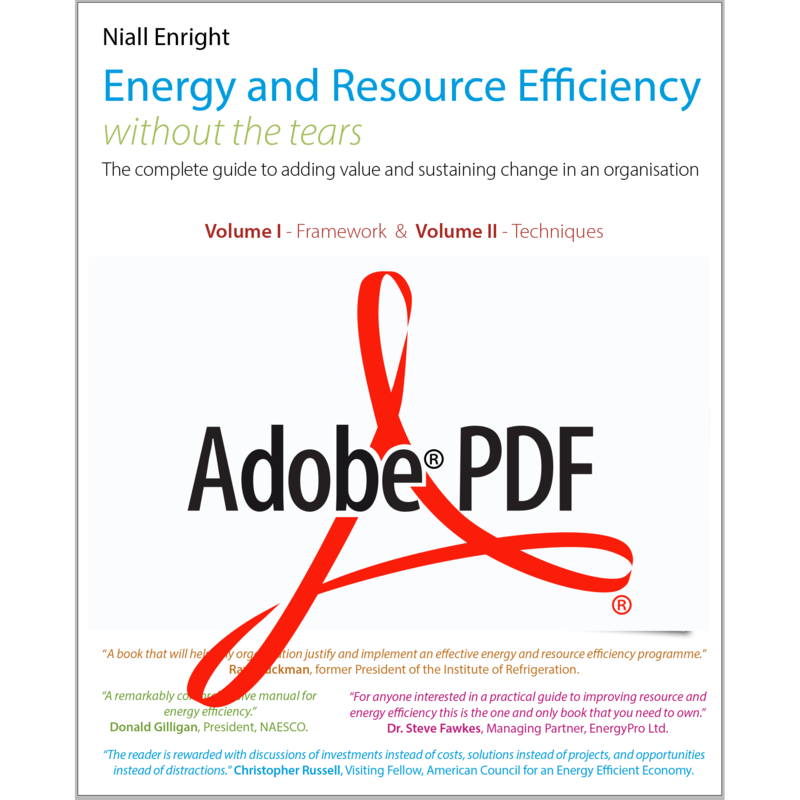 This post complements an earlier item on the value of involving management in the audit process: “The purpose of a resource efficiency audit”. I have worked on a recent project where a maturity matrix has been the central tool to define the direction and priorities for site-level energy efficiency programs in a global business. This particular organisation faced a number of very common challenges in constructing a global energy efficiency programme: the operating units were very diverse and varied hugely in their approach to energy efficiency; the corporate team did not want to be seen as imposing an external view on the sites (which rarely works); and, as usual, there was often a perception at sites that energy efficiency was just about technology. What emerged as a solution was an advanced form of maturity matrix, which could provide the basis for a full-day workshop that brought together a number of departmental heads and specialists to define a prioritised plan for their own site. The maturity matrix was a souped-up excel spreadsheet with six themes: “Leadership and Context”, “Measurement”, “Opportunity Assessment”, “Project Implementation”, “Continuous Improvement” and “KPI’s and Communication” on different tabs. 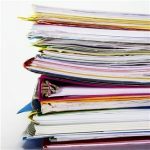 Over many years I have observed hundreds of energy efficiency and waste minimisation audits conducted by external consultants on behalf of a wide range of industrial, commercial and public sector clients, but one thing puzzled me greatly and this had to do with the purpose of a resource efficiency audit. It was clear to me that most clients saw the aim of an audit as the production of the audit report, detailing a range of recommendations along with a cost-benefit analysis. Everything about the assignment reinforced this viewpoint. The Consulting firms each had their own consistent reporting format, which they jealously protected, and their proposal documents all talked about the specific content and time-frames for delivery of the report. The idea of the report as the product was further reinforced by the payment schedule where the final fees typically become due once the draft report had been reviewed and approved. 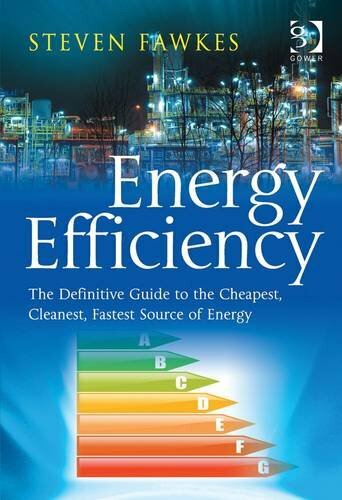 This is almost certainly one of the best book on energy management ever written. I’ve got to say right from the outset that Christopher Russell is absolutely spot-on with his diagnosis of the reasons why organisations fail to realise the very substantial financial benefits associated with energy efficiency. It is refreshing that he not only diagnoses the barriers, but offers a wide range of solutions – some innovative, some challenging, but all thoroughly practical. His focus on leadership, organisation, roles and financial business cases touches the core issues for successful energy management. 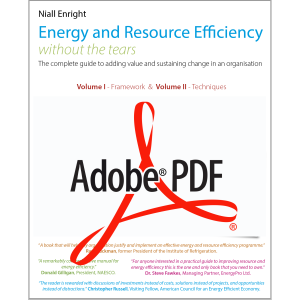 He beautifully demonstrates the stupidity and value-destruction in the way many organisations approach energy efficiency. The challenge is not around technical solutions (we largely know how to save energy) but in getting these solutions implemented – in raising them to the top of the corporate agenda. 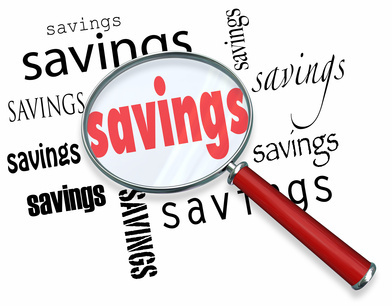 Most members of IEMA will undoubtedly have heard of Marginal Abatement Cost Curves, which are regularly used in climate change circles to help visualise complex data about carbon costs and emissions volumes. 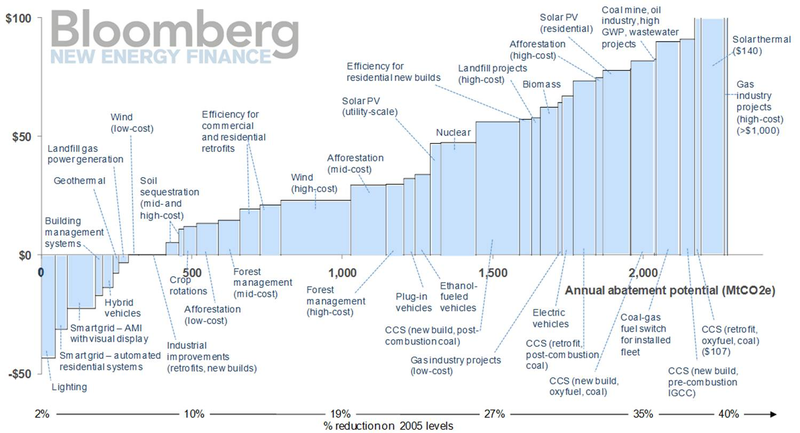 Below is an example of such a “curve” which illustrates the potential for different technologies to reduce greenhouse gas emissions in the USA. If we look at the chart we can see that the technologies are ranked in ascending order of cost per tonne CO2equivalent (tCO2e)– that is to say that those projects that have the lowest cost (per tCO2e reduced) are on the left and those with the highest cost are on the right. 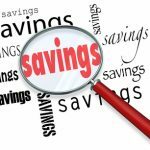 Technologies below the line actually make a saving (a negative cost) over their lifetime – perhaps because they reduce energy consumption as well as carbon. The Carbon Reduction Commitment (CRC) recently was renamed as “The CRC Energy Efficiency Scheme”. This article will look at why energy efficiency should be central to any organisation’s response to the CRC legislation. It is not always appreciated that, in the short term, the financial implications of the CRC are relatively small. The table below illustrates that for an organisation consuming £1m of gas and electricity in equal measure, the cost of the emissions allowances under the CRC is around £87,000.